Here you can read up on Eminem or rather Marshall Mathers and his family. Hailie Jade Scott (Mathers) is the daughter of Eminem and his wife Kimberly Ann Scott. She was born on December 25, 1995. The songs "Mockingbird" on Eminem's album Encore, "Hailie's Song" on The Eminem Show, and Eminem's 2005 single "When I'm Gone" are dedicated to her. Hailie joins her father in the hook for "My Dad's Gone Crazy." She also features prominently in a number of his other songs, most notably in Just The Two Of Us on The Slim Shady EP, later renamed '97 Bonnie & Clyde on The Slim Shady LP, which is a fictional account of Eminem, accompanied by Hailie, dumping the dead body of his wife into a lake, while he talks lovingly to his daughter in baby-talk. Alaina Mathers is Eminem's eleven-year-old adopted daughter, and the biological daughter of his wife's twin sister. Eminem has custody of his niece and is raising her as Hailie's sister. She is also referenced in the song "Mockingbird" on Encore, as "Laney". Nathan Mathers is Eminem's younger half-brother by 14 years, and is in his legal custody. Eminem is also determined to get custody of Whitney, Kim's child by another man, in order to become the girl's father. Eminem is quoted as saying about Whitney: "I'm in love with that girl, man. She's so sweet and funny." He plans to change Whitney's last name to Mathers. Divorced first wife, Janice. Remarried Katherine. Was sentenced to eight years in prison for manslaughter for shooting Janice's brother in self-defence. Educated in law, Todd is campaigning against asbestos use in prisons. Unfortunately he commited suicide. Todd Nelson shot himself in the head as he sat in his car. He had become depressed over a sheriff's rottweiler which was allegedly terrorising his family. The 42-year-old helped raise Eminem, whose real father walked out when the rapper was a baby. Lives with his father, Todd. Still in High School, excelling in mechanics. Thought to feature as the young, snubbed autograph-seeker in Eminem's hit single, Stan. And is graduated. nor is affiliated or endorsed by the artist or label. All trademarks and copyrights on this page are owned by their respective owners. 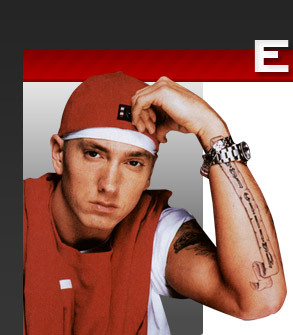 At Eminemlab.com you will find Eminem lyrics, information, Eminem wallpapers and screensavers, Eminem interviews, hip hop games and a lot more.